These premium grill covers from Kingkong offer a combination of high quality materials and innovative features that give your grill a full protection over many seasons. The new generation covers are as rugged as vinyl, but more breathable and pliable even in extreme cold conditions. Providing year-round protection from the environment, these fabric covers carry a generous 3-year. Fit Weber Genesis 300 series including E-310, E-330, EP-310, EP-330, S-310, and S-330. Genesis II E-310. Fit Char-Broil 4 Burner. Doesn't fit the Weber Genesis II E-410. Doesn't fit the Weber Genesis Silver C grill. Notice: Pls follow the Weber model listed rather than the dimensions, because there maybe exist differences measured by different ways. 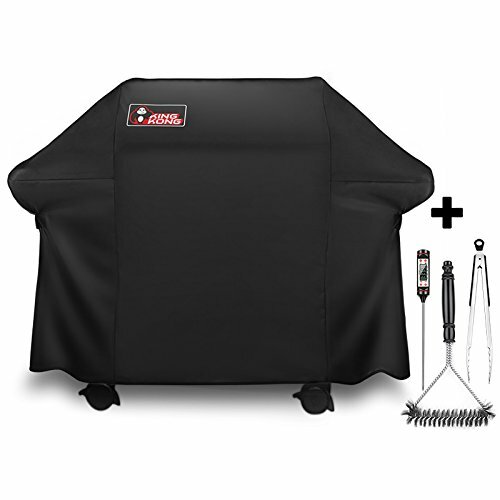 The kingkong grill cover enjoys 36-month worry-free Guarantee and 60 days money-back! If you have any questions about this product by King Kong, contact us by completing and submitting the form below. If you are looking for a specif part number, please include it with your message.